Second grader Owen Edwards of Burcham Elementary School won a shiny new bicycle for his first-place entry in the Long Beach Unified School District’s second annual Healthy Recipe Contest. Nutrition Services held the contest recently in honor of National School Lunch Week. Recipes had to include a fruit or vegetable, five ingredients or less, a written story and a picture or drawing of the recipe. Three recipes were selected based upon nutritional value, recipe requirements and appearance. These recipes were prepared, tasted and voted on by a panel of food service professionals. The top recipe in this year’s contest was a no-bake breakfast peach crisp. 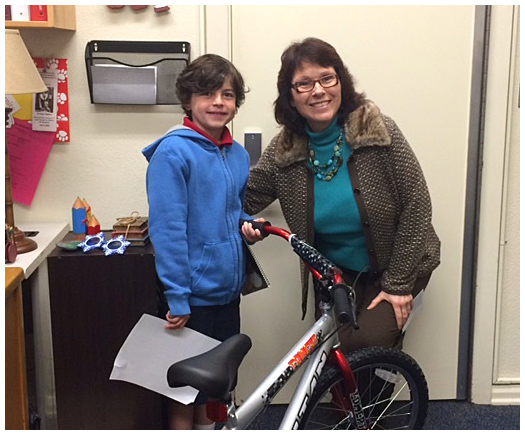 As the grand prize winner of the contest, Owen received a new bike during Burcham’s televised weekly announcement. Owen’s recipe created a stir when it was made and served as a breakfast entrée at Burcham’s school cafeteria. The celebratory event had students lining up to taste the layered cups of cinnamon peaches, vanilla yogurt and fresh granola as they came through the breakfast line. “The kids loved it and were asking when we were going to have it again,” said Burcham’s Nutrition Services Supervisor Denise Limbocker. WINNING RECIPE – Burcham Elementary School second grader Owen Edwards receives a new bicycle for earning first place in a healthy recipe contest. Presenting the bike is Nutrition Services Director Darlene Martin.